Specs: Summit elevation: 10,550′; Base elevation: 8530′. 12 Lifts: 1 quad, 3 triples, 4 doubles, 4 surface. Uphill capacity: 11,248/hr. Terrain Mix: 25-40-35. Longest Run: 16,800′. Season: usually late November to mid April. Rentals & Lessons. No snowboards. Annual Snowfall: 500″. Snowmaking: 2%. The SKInny: Here’s one of the most storied ski areas in the Rockies, with some of the finest powder on the planet, holding out against snowboarding. Now look, snowboards and boarders are cool; but it is nice to just ski among skiers once in a while. Once the dust settles and snowboarding becomes the domain of true snowboarders (as opposed to the obnoxious kids who ruled the sport in the 2000s) you’ll see the holdouts like Alta open their doors to the single plankers. Back to Alta….this is really a skier’s ski area; not the best for beginners or developing blues but still has plenty of terrain for those skiers. 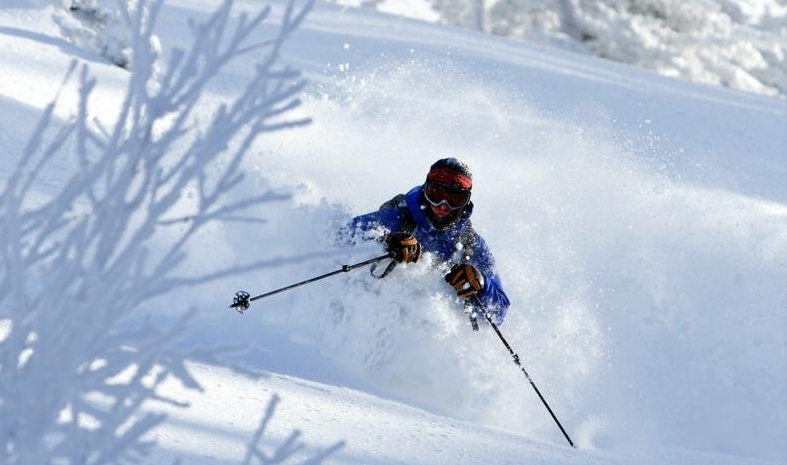 Great for hotshots, but most hotshots look for a little more apres-ski than Alta offers. Alta is an ideal resort for good, expert skiers who don’t particularly need a lot of nonsense like theme restaurants, clocktower villages, etc. Not overly groomed, some trekking required, some slower lifts, lots of moguls. Steep, deep, and relatively cheap. Wanderer’s heaven. This is arguably the #1 ski area in the USA for true expert skiers. Signature Trails: Alf’s High Rustler. Specs: Summit elevation: 8800′; Base elevation: 7200′. 5 Lifts: 3 doubles, 2 surface. Uphill capacity: 2700/hr. Terrain Mix: 26-18-56. Longest Run: 10,560′. Season: usually December to March. Rentals & Lessons. Annual Snowfall: 400″. The SKInny: Comfortable mid-sized family run ski area, with lots of runs and hidden chutes and routes. A lot of skiable acreage for the vertical due to the “open” spaces on the mountain. While there are only 20 “official” runs, each has opportunities to move about, try various routes, etc. so the mountain feels like it has a lot more than the trail map shows. Plenty of steep runs, and a few long easier runs, with a separate area “Little Beaver,” for learning skiers. Isolated, usually uncrowded — Saturdays can be quite busy, minimal services. A great ski area since the late 1930s. Specs: Summit elevation: 11,307′; Base elevation: 9600′. 9 Lifts: snowcat, 5 triples, 1 double, 2 surface. Uphill capacity: 10,500/hr. Terrain Mix: 40-40-20. Longest Run: 7920′. Season: usually late November to early April. Night Skiing fri-sat. Rentals & Lessons. Annual Snowfall: 425″. Snowmaking: 35%. The SKInny: This is a terrific, off-the-beaten-path resort with a little something for everyone. Spread out, built on three high desert mountains. Navajo area is beginner/novice stuff, Giant Steps is an all-around ski area, and Brian Head Mountain is cat served and primarily for experts. Do know that the Navajo Peak and Giant Steps/Brian Head areas are not connected by ski trails; a shuttle is required. The Brian Head cat skiing is nice for powder hounds who happen to be here, but not worth seeking out on its own. A quiet, underdeveloped, underskied resort. Short liftlines always. Hotshots will prefer other resorts, while the wanderer could be content here for a couple days. Really for families and others interested in an outstanding — and quiet — skiing experience. Nobody will call Brian Head the best in Utah, but quite a few call it their favorite. Specs: Summit elevation: 10,500′; Base elevation: 8755′. 8 Lifts: 3 quads, 1 triple, 3 doubles, 1 rope tow. Uphill capacity: 10,100/hr. Terrain Mix: 21-40-39. Longest Run: 15,840′. Season: usually mid November to early April. Night skiing. Rentals & Lessons. Annual Snowfall: 500″. Snowmaking: 20%. The SKInny: Nice mountain, lots of powder, short liftlines. Well-rounded terrain; something here for everyone. Great backcountry opportunities. Although not as big or steep as the other Cottonwood Canyon resorts, Brighton feels like four ski areas in one. A lot of the snowboarders who aren’t welcome at Alta head for Brighton. Mostly locals, as it has been a favorite for SLC residents since 1936. With the exception of Great Western, each mountain/lift area has trails for every ability. Now owned by Boyne Corp. (the Michigan based resort operator), Brighton definitely seeks a “new school” crowd. The Canyons See Park City, below. Specs: Summit elevation: 9570′; Base elevation: 6570′. 19 Lifts: 1 gondie, 9 quads, 7 triples, 2 doubles. Uphill capacity: 39,700/hr. Terrain Mix: 15-50-35. Longest Run: 10,560′. Season: usually early December to early April. Rentals & Lessons. Annual Snowfall: 300″. Snowmaking: 29%. No snowboarding permitted. The SKInny: As Utah resorts go, Deer Valley is a bit more developed, the mountain is a bit crowded, it all feels a little commercial. Deer Valley covers four distinct areas: Bald Eagle Mt, Flagstaff Mt, and Empire Canyon are all primarily beginner/intermediate country; while Bald Mt. is intermediate/expert terrain. Other than Bald Eagle, each area has access to either glades or off-piste bowls or both. Bald Eagle houses the beginner areas, the condo complexes, theme park and ferris wheel (just kidding on the last two) and is the reason Deer Valley gets the largely undeserved rap of being overly developed. (It really isn’t). But admittedly, the Little Baldy area criss-crosses more roads, winding condoplex driveways, and pricey housing developments than probably any other ski area in the world. It is as if this section of the ski area was built to serve the homeowners. Do know that the 3,000′ vertical can’t really be skied continuously; 2,000′ is about it. Beyond that, Deer Valley is one of the outstanding ski areas for emerging blues and those starting on the diamonds. Originally started life as Snow Park (1947-1965) then shuttered and reopened as Deer Valley in 1981. Trails are meticulously groomed; the closest comparison is Vermont’s Okemo. Any time you ski at Deer Valley you’ll feel as if you are a better skier thanks to the fleet of groomers. OK for hotshots, great for wanderers. Otherwise, the closest thing you can compare Deer Valley to is the Ritz-Carlton. You’re living in high cotton, and you pay accordingly. Here’s another litmus test: If you honestly, deep down, prefer golf to skiing, this is your type of ski area. But make no mistake, it is much, much more than just that. Right now, Deer Valley is the top of the heap for customer service and a top-notch ski area. Signature Trail: Daly Chutes, Daly Bowl, Stein’s. Please click here for our in-depth guide to skiing and getting around at Deer Valley Resort. Elk Meadows, Beaver • see Eagle Point, immediately below. Eagle Point, Beaver • 400-600 skiable acres on 1400′ vertical Reopened! Huzzah! Specs: Summit elevation: 10,400′; Base elevation: 9000′. 5 Lifts: 1 quad, 1 triple, 3 doubles, 1 surface. Uphill capacity: 8000/hr. Terrain Mix: 15-60-25. Longest Run: 14,520′. Season: usually December to early April. Rentals & Lessons. Annual Snowfall: 400″. The SKInny: Originally Elk Meadows, which closed for a time due to some sort of water or water treatment wranglings, or funding, or something like that. I was at Elk Meadows once, and I can tell you it’s so far off the beaten path it makes Brian Head look downright metropolitan. A great mid-sized ski area with no liftlines, no commercialized anything. Highly recommended. New ownership has really turned things around…reconstructed lodges, restored lifts, it’s a marvelous Cinderella story and a great ski area. For the true pedal-to-the-metal experts, Eagle Point has access to the Fishlake National Forest backcountry. Nordic Valley, Eden • see Wolf Mountain, below. Park City Specs: Summit elevation: 10,000′; Base elevation: 6900′. 14 Lifts: 4 sixpacks, 1 quad, 5 triples, 4 doubles, 1 magic carpet. Uphill capacity: 27,200/hr. Terrain Mix: 18-44-38. Longest Run: 18,480′. Season: usually mid November to mid April. Night skiing Dec-Mar. Rentals & Lessons. Annual Snowfall: 350″. Snowmaking: 15%. Canyons/Park West Specs: Summit elevation: 9990′; Base elevation: 6800′. 16 Lifts: 2 gondies, 9 quads, 2 triples, 1 double, 2 surface. Uphill capacity: 32,700/hr. Terrain Mix: 14-44-26-16. Longest Run: 13,200′. Season: usually mid November to mid April. Rentals & Lessons. Annual Snowfall: 350″. Snowmaking: 4%. The SKInny: After Powdr Corp’s now legendary office task hiccup, Vail Resorts took over and has merged Park City with The Canyons. The two are now one — connected by a gondy — although still very much two separate sections and atmospheres. So for the next couple seasons we’re going to keep these descriptions separate. One thing you can be sure of: If someone gets separated from your party, you are more likely to find gold than to find them. Park City: One of the legendary ski areas with historic runs that unfortunately is more City than Parkthese days. Weekends can be crowded. Quite crowded. The atmosphere is busy, mobbed, developed…ok if you happen to like that. Yes, you can get to some remote spots. The Jupiter Bowl is still a legendary spot for hotshots. Wanderers can find plenty to do here, and families will love the abundance of intermediate level terrain. The big, easy intermediate cruisers offer just enough variety that the expert will enjoy them as well. In fact the trail called Payday is arguably one of the progenitors of the rolling groomed cruisers that are the mainstay of ski resort offerings. Another plus for Park City: it’s hard to think of a bigger, better resort so close to a major metropolitan airport. As mega resort communities go, Park City is pleasant, safe, convenient. Probably one of the finest destinations for GolfCondoSkiers. Let’s face it, serious skiers will prefer Alta, Snowbird, Snowbasin, etc. but it’s really hard to have a bad day of skiing at Park City. The Canyons section: Quiet little Park West was engulfed by the American Skiing Company (once owners of Killington, Mount Snow, Steamboat) in 1997. What was a well-done cheap little local ski area became a pricey, sprawling monstrosity with hyper-quick lifts that run all over creation to serve eight mid-sized mountains. Now it is an impressive operation, to be sure, but it just sprawls a little too much. The 3,000+ vertical is not continuous; about 1900′ is the max you’ll get on any one run. The canyons at The Canyons make for interesting runs, but unfortunately many of them have long run outs — and some are uphill. Locals head to Alta or Brighton, and refer to The Canyons as “a tourist area that used to be a great little spot.” On the positive side, you can expect the quickest, most modern lifts and incredible variety of terrain. Hotshots will prefer Alta or Snowbird, without question. Wanderers, on the other hand, will likely never find a resort to beat The Canyons. You can create your own routes, find hidden glades, tuck down little used canyon chutes…literally ski for days and days and never use the same route twice. Park City Signature Trails: Payday, Jupiter Bowl. Signature Trail, Canyons section: The Black Hole. Specs: Summit elevation: 8900′; Base elevation: 7600′. 7 Lifts: 1 quad, 1 triple, 2 doubles, 1 platter pull, 2 rope tows; cat skiing. Uphill capacity: 6350/hr. Terrain Mix: 10-60-30. Longest Run: 15,840′. Season: usually late November to early April. Night skiing. Rentals & Lessons. Annual Snowfall: 500″. The SKInny: Quiet little Powder Mountain quietly offers some of the best skiing in Utah. Some of the best skiing in the country for that matter. Outstanding snow. Undeveloped mountainside. Easy to find powder runs. Endless backcountry. Rumor is that new money wants to move in and turn it into GolfCondoSkiWorld replete with 475 $4,000,000 homes, 1,000 million-dollar condos, two hotels, two golf courses…really screw it up. What is today a great spot for real skiers will someday be a great spot for vacationing golfers, replete with theme restaurants and a built-to-order village. But for now, Powder Mountain is what a ski area should be. It sprawls over six distinct peaks, with canyons, glades, long ridge runs, bowls, and powder, powder, powder. The lifts are a mix of new hi-speed quads, school buses and clumsy platter pulls. The lodges are small and rustic. The slopes are uncrowded, even on Saturdays. Just pick a line and ski it. Look, we could go on and on in this description, but it isn’t necessary. Powder Mountain is simply one of the best ski areas on the planet. Period. Signature Trails: Straight Shot, anything in Cobabe Canyon. Specs: Summit elevation: 9250′; Base elevation: 5850′. 9 Lifts: 1 tram, 2 gondies, 1 quad, 4 triples, 1 double. Uphill capacity: 14,650/hr. Terrain Mix: 11-49-40. Longest Run: 15,840′. Season: usually late November to early April. Rentals & Lessons. Annual Snowfall: 400″. Snowmaking: 34%. The SKInny: Owned by Sun Valley, site of the 2002 Olympic Downhill, Snowbasin is a ski area to be reckoned with. 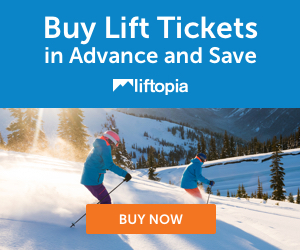 Lines are virtually nonexistent, and the lifts run hither and thither and can ferry you anywhere quickly. Only 40 odd miles from the airport, it’s just a matter of time before this place is “discovered” and becomes as crowded as the rest of the mega Utah resorts. The knock is that some of the trails have long run-outs. Nah. The terrain seems like it’s mostly well-groomed cruisers, but that’s because that’s all they show on the map. There’s terrain here for everybody, from flat-out beginners to out-and-out big mountain freakzoid hotshots. Runs are long. Unfortunately nothing here the equal of Alta or Snowbird, just a good skiing mountain. Watch out for this place…reputation will soon equal the better known resorts. A great resort for wanderers, hotshots, families…you name it. Also one of the few where most of the advertised terrain is legitimately accessible from a lift of some sort. Be warned that when you step into the lodge, you will not think that you are in a ski lodge. Lots of elevators, oriental carpeting, magnificent construction, granite, marble, oak…the lodges are almost more impressive than the skiing. Snowbasin is most similar to Deer Valley in terms of ritzy, and in some ways out-does DVR. We’re pretty sure the brass railings are polished more frequently at Snowbasin. Signature Trails: John Paul, Elk Ridge, Main Street. Specs: Summit elevation: 11,000′; Base elevation: 7760′. 10 Lifts: 1 tram, 2 quads, 7 doubles. Uphill capacity: 15,000/hr. Terrain Mix: 27-38-35. Longest Run: 18,560′. Season: usually November to mid-May. Night skiing. Rentals & Lessons. Annual Snowfall: 500″. Snowmaking: 15%. The SKInny: The Bird is easily one of the biggest, best ski areas in the country. Where Alta is old school, Snowbird somehow stays hip and trendy. Plenty of terrain, plenty steep, decidedly not cheap. Lots for hotshots, wanderers…even the emerging intermediate can find ways to keep busy for days on end. The closest comparison to Snowbird in the USA is Jackson Hole, and most will admit that Snowbird pulls down better snow and more agreeable weather. Day in and day out, more skiers with the most skill and finest form are found at Snowbird than any other resort in the Rockies. (Vermont’s Stowe takes Eastern honors). In fact, everyone short of true expert skiers will likely find other resorts more to their liking. The knock on the Bird is the lack of apres-ski (we don’t care) and the fact that the trail ratings should be turned up a notch. Greens should be blues, blues should be blacks, etc. Double blacks are for the serious, pedal-to-the-metal only. If you ski blacks elsewhere, do not attempt the double blacks at the Bird right out of the chute. This is seriously tough stuff. We would put Snowbird ahead of Alta, simply because the lifts are faster and very little traversing is required. In any event, Snowbird fights for all-around best in the nation with a handful of other resorts: Sun Valley, Jackson Hole, Squaw Valley, Vail, etc. Signature Trails: Regulator Johnson, Great Scott. Specs: Summit elevation: 10,035′; Base elevation: 7988′. 8 Lifts: 2 quads, 2 triples, 4 doubles. Uphill capacity: 12,500/hr. Terrain Mix: 20-50-30. Longest Run: 15,800′. Season: usually mid November to mid April. Rentals & Lessons. Annual Snowfall: 500″. Snowmaking: 20%. The SKInny: Big ski area that doesn’t seem to have the crowds or pretense of others in the Cottonwoods. Biggest knock is the clunky lift system, the fact that you have to trudge around to access certain trails, and that you may have to move from lift to lift depending on where you want to ski. Skiers who frequent Solitude skip tend to skip Alta and Snowbird in favor of this area, which speaks volumes. Solitude has the cutesy clocktower village and all the other jimcrack, but is still one of the most well-rounded of the Cottonwood Canyon ski areas; plenty for novice and expert alike. Some great cruisers, some excellent powder bowls. Because some of the powder runs require a hike, you can almost always count on finding some sort of untracked something at Solitude. Signature Trails: Dynamite, Honeycomb Canyon, Challenger. Specs: Summit elevation: 8250′; Base elevation: 6100′. 3 Lifts: 1 quad, 2 triples. Uphill capacity: 5167/hr. Terrain Mix: 20-40-40. Longest Run: 13,200′. Season: usually early December to early April. Rentals & Lessons. Annual Snowfall: 500″. Snowmaking: 100%. The SKInny: Probably the oddball among Utah resorts, and Sundance prefers it that way. Few lifts, less terrain, lots of vertical, no lines. Has skiing for every ability off the summit. It’s also one of a handful of Utah ski areas that doesn’t offer a view of a city somewhere. Wanderers will prefer the big areas, as will hotshots. But everybody really enjoys the quality skiing at Sundance; it just seems that the lack of quantity compared to other Utah resorts makes it one of those “Yeah, we hit Sundance at least once or twice a year, but generally go to…” It’s also a little bit, uh, “odd” for the casual GolfCondoSkier. Everyone knows Sundance was founded by Robert Redford, and it seems to attract more than the average number of cosmically-attuned weirdos, animal-rights activists with leather coats, and overly environmentally conscious nutjobs with more money than brains. Maybe it just seems that way. In any case, the skiing is top shelf, the resort is well run, and the atmosphere is fantastic. The occasional kook just kind of adds to the mix, and is hardly noticeable amidst the drop-dead beauty of this resort. A little history here: During the construction of Sundance, Redford and the design team hiked and explored almost every inch of the mountain to plan the trails, rather than design from topo maps. The payoff is that the trails at Sundance work with the terrain, and the skiing is exhilirating. Specs: Summit elevation: 6500′; Base elevation: 5500′. 3 Lifts: 2 doubles, 1 surface. Uphill capacity: 4400/hr. Terrain Mix: 25-45-30. Longest Run: 3200′. Season: usually December to Mid-March. Night skiing. Rentals & Lessons. Annual Snowfall: 350″. The SKInny: CLOSED — WILL UPDATE Formerly known as Nordic Valley, Wolf Mountain is Ogden’s local ski hangout, complete with night skiing, and a top ticket price in the neighborhood of $25. Picture the average eastern ski area plunked down on the Wasatch range, add some Utah powder, and you’ve pretty much got this place pegged. None of the terrain is over-the-top in terms of difficulty; this is just a fun ski area and one of the best deals you’ll ever find. Virtually everybody can ski from the, uh, “summit” — which is actually only a third of the way up the mountain. New ownership has livened up the place; a lot of families use lodging at and around Wolf as a base for a ski vacation, spending time at the host mountain with visits to nearby Powder and Snowbasin. You’ll never confuse Wolf with Alta, but that’s ok, it’s still a terrific place. UPDATE: Closed following the 2012 season; auction pending. Let’s hope someone takes over and this place gets back on its feet.